Melody is an American Girl of Today #GT12E. I have always been a doll person. Though being blonde (dark blonde) with brown eyes I couldn't find look-alike dolls as easily as my blue-eyed friends. Oh, well, I survived. Later one of my cousins mentioned wanting the Samantha American Girl doll and I checked it out. The dolls were beautiful and I loved the idea of learning about history while playing. Then I looked at the catalog and saw the American Girl of Today dolls offered a brown-eyed doll with blonde hair...I knew what I wanted for Christmas! Back then the package deal included a doll in her meet outfit (AGoT included a write your own history book with guide and stencils), accessories, and Coconut for a little over $100. One of the best Christmases ever! How did Melody get her unique name? Melody is the drummer for Josie and the Pussycats - she was always my favorite of the group. Friendly, fun loving, ready to smile and lend a helping hand, and always underestimated due to her unorthodox thinking patterns. Quinn...I've always liked the song Mighty Quinn (Quinn the Eskimo). The song was written by Bob Dylan and has been released as both Quinn the Eskimo and Mighty Quinn. The most popular version was recorded by the British group Manfred Mann and released in 1968. Quinn is a character whose arrival attracts the attention of local fauna; turns despair to joy; and chaos into rest. In the song Quinn is a guy, but the name has become unisex over the years. After getting Melody, I received the catalog regularly and enjoyed building my wishlists. Mostly outfits and accessories. I did like another doll due to a slim connection to my heritage. However, I never really thought I'd get her. 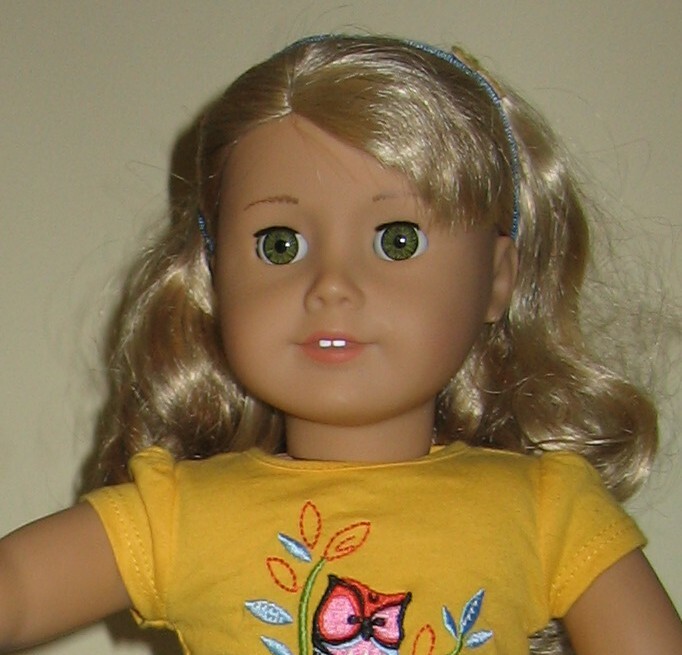 Kirsten is one of the first American Girl historical dolls. She and her family describe what life was like for the Swedish pioneers who traveled to and homesteaded the Midwest US. She has always peaked my interest as my great grandmother, Ingeborg Kristina Lindquist, came over from Sweden to join her siblings that had already immigrated to the US. (My grandmother taught me how to say thank you in Swedish.) So while I have read and enjoyed the Kristen Larson books from American Girl, my Kirsten is really Kirsten Larson Lindquist Silverleaf. I received her as a gift in 2009, the year her retirement was announced, so her collection is incomplete. Still building wishlists from the catalogs, I was beyond excited when one arrived announcing a new American Girl historical doll. The first American Girl. Kaya'aton'my' represents the Native American tribe of Nimiipuu or Nez Perce. She is AWESOME! I have always had a great love and respect for Native Americans. An interest that led me to read and learn about the different tribes (my knowledge is still lacking), and write reports about their cultures or how they tried to work with the European settlers, but were betrayed. I've never quite understood my deep feeling for Native Americans, but I don't question it either. I was so thrilled that the company acknowledged the true American girl that she moved to the very top of my wishlist. Still I never thought I would get her. She too was a gift in 2009 and arrived with Kirsten. Previous girls of the year held little interest for me beyond reading their books and maybe getting a couple of items from their collections. Then came Lanie. Why is she special? Here is another doll with a personal connection. When I read her description, I laughed and emailed my family with the picture and details joking that I had to get her. You see, I have an Aunt Lanie who loves the outdoors, gardens, and has siblings (though more than Lanie Holland). Plus Lanie (doll) has a pet bunny and at the time we had 3 house rabbits (we still have 1). She just fit too perfectly. Before the beginning of Summer 2010, Lanie joined my collection. Note: Lanie Holland Silverleaf also loves to cook and bake. 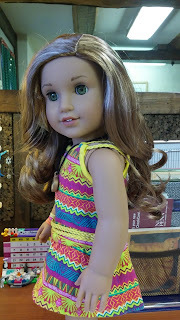 "Okay, four is my favorite number...I should be done getting AG dolls, but not adding items to their collection (wardrobe, accessories, furniture)." Hahahahaha! How things change. Read on McDuff. Haley joined the family on November 23, 2013. She was a gift from a dear friend, Lady Doli. Doli had started looking for 18" dolls for her granddaughters and purchased the Avon edition Madame Alexander doll. Then she changed her search direction and offered Haley to me. Haley is quite lovely. She compliments the others quite nicely in her looks (brunette with brown eyes) and personality. Unlike the AG dolls, she does not come with a story...she's a blank slate. It was fun to have our readers help choose her middle name (Amaya submitted Rose). What have we learned since she joined the family? Haley is quiet and somewhat shy. She is always polite and happy to share. She was thrilled to get her own American Girl doll and teddy bear. She really enjoys Legos and while she follows the directions the first time she never touches the "kra-gl." Haley loves animals and pop music and reading. Of course, she loves drinking tea, but her other favorite beverages include milk and Klass Mango drink when we can get the mix. Our family complete? Um, no. At the end of 2014 when Grace Thomas was revealed, like almost everyone else, I was excited. I sent the photo and description to Gramma Enne; together we discussed how she shared the same name as her mom/my Grammy as well as the love of baking. After the big reveal I was still excited, even though her eye color wasn't right to be a true representation. "So are you getting Grace?" became a routine question when Enne and I talked about American Girl. I had a whole year to decide; and took almost the entire year too. In the end, the beautiful photos I saw on other blogs outweighed the trifling negatives in reviews and Grace came to join the Tea Time with Melody Q crew shortly before Christmas. We're thrilled she came to stay. Welcome Grace Thomasina Silverleaf! Is the family done growing? Not just yet, We see Lea joining us. You know how it is, throughout the year little leaks of information of what is to come start spilling into the blogiverse or blogosphere. I try to avoid them, but it's impossible. When one of the leaks showed the name of the Girl of the Year as Lea Clark I could barely contain myself. That is my cousin's name and it is spelled just the same. As time progressed, I was even more thrilled to learn that the name was also pronounced like hers and that the name was not a prototype. Yay! When she was finally revealed I knew she'd be coming to join the family but thought it could take as long as it took Grace. However, January brought a great bundle with free shipping weekend and I couldn't pass it up. Lea arrived February 4 and was introduced to the blog family shortly thereafter. Lea, what makes her so special? Like Lanie and Grace she represents a fabulous member of my human family. Though a cousin, Lea is more like a big sister to me. The similarities include skin tone, hair color, and the love of travel and taking photographs. The hair and eyes are slightly off, but my Lea mentioned she'd always wanted long hair and green eyes. Welcome Lea Clark Silverleaf! So awesome that you mention the song Mighty Quinn! That's one of my favorite songs because my nickname is actually Quynh (it's Vietnamese but said the same) and when my (now) husband first met, he made me a "mix" and put that song on it and I had never heard of it! He told me it totally made him think of me though. Thanks for commenting on my boys! I am so glad you have enjoyed the customizations I have done. That's all I have really wanted to do - just delight others as much as I have been delighted. Thank you for stopping by. I will go visit your blog in the near future. Done! :) Nice look and great cast of characters. I have a doll named Melody too! Except she's a Gotz beautiful girlhood doll from vision forum. I love your blog! Please check out mine sometime. Definitely! I also like the name Ashley. I'm going to get an AG doll sometime soon as well....I'm SO glad you liked my blog! Thanks for commenting! That will be fun. The AG Dolls are really nice. Ashley is a great name. Has a great history too...was once a boys name that transitioned to the girls. Yeah, I didn't know that until we watched the voice, because there was a boy called Ashley on it! I think it's alot better as a girl's name, though. On Castle, Alexis's boyfriend was named Ashley. I like it for both. Kind of exotic. That's alright. I love your blog! I often enjoy reading other people's blogs, because it gives me great ideas for mine! I'd like to do photo stories and tutorials, but my little brother broke our camera, so we have to make to with the iPad cameras for now, and they don't take very good photos :( so I'm asking for my own digital camera for Christmas. Melody is MY name!! Lol! It's funny but I don't know very many people with that name! Molly is very nice. Her story is pretty cool too. WWII was a hard time to live through. I love your website! thanks for coming to mine! Thank you and you're welcome. It's fun to check out the different blogs. Do you make any of your doll's clothes? I make clothes for Melody all the time. It's so much fun, and I often use clothes I've grown out of (if they're not too tatty and worn out) to up-cycle into clothes for her! Sadly, I did not get that specific skill set. My mom is decent at sewing, but my grandmother was the best. I did find a few things I made for other dolls when I was younger and laughed a LOT. My favorite finishing tool was the pinking shears. I do know enough to look for certain things and to admire others' handiwork. Up-cycling your clothes is a great idea. I do keep thinking about making a few infinity scarves, but haven't quite figured it out yet. That's a pity. My mum taught me how to sew when I was 4, and my first project was a running-rooster pot holder for my Grandma for Christmas. She loved it, and still has it to this day as far as I know, but I hated sewing it, because I had to do it all by hand and it took forEVER!!!!! I really like sewing now though, and I'm hoping to open an Etsy shop to sell clothes for 18-inch dolls sometime soon. I just need to get about half a dozen items to sell ready, and then I'm allowed to list them and open my shop. Yeah, pinking shears are really handy to have, but it's so tricky to cut perfectly straight with them, and so frustrating sometimes!!! And what are infinity scarves? I've never heard of them. I do have some skills...just not very polished. I did make a black and white cat costume for myself one year. the big thing for me is that my machine's tension is out of whack and I can't get it corrected. Yes, it takes some practice to get the straight lines with pinking shears. Infinity scarves...they look like you are wearing a rectangular pashmina scarf, but are really a loop with no ends. But full and drapey. That's a pain. It's so annoying when your machine's tension is not working. My sewing machine is an old 1961 Singer. It sews really well, except that it won't sew really thick, or really thin fabric, and it all jams up for some reason sometimes, I think I might need to get it serviced when I have enough money. My mum knows someone who does services on Singers for around 30 dollars or so, but then, it might just be my machine, I really don't know! Neat. Mine is from the 1950s (not sure if this link will work to show the ad http://file.vintageadbrowser.com/l-9quomkv3bpxxdb.jpg ). The stitch dial is broken so I only have zig zag and straight, but those are the only two I've ever used. Just that darn tension. I was thinking of taking a big scarf and cutting it down, giving it a twist, and either sewing the ends together to make a loop or finishing the end and adding a snap closure. Nice machine! Mine actually looks alot like it! My mum's one is a gorgeous mint green 1950's Singer. It's normally the nicest machine ever, but it's a bit broken at the moment for some reason. I think it got a bit jammed up. I really do like it. I should try to fuss with the tension again. Harry Potter calendar... oh, yeah! I loved hearing about your dolls, I bet they're all really special to you huh? Yes, they are very special. And you have reminded me that I have to update this page to add Haley. She should be pouting about not being included. She's still the "new girl." You have a beautiful and unique collection! Nice collection! Haha, when I had three dolls I didn't think I would get any more and now I have five dolls! And you remind me I still have to update this page to include Haley. Thankfully, she hasn't started any major pouting about this...yet. My friend Melody (Davis) is an AGOT #20 (retired). My mom said she got her name from the Archies song "Melody Hill". When we sing it, she breaks in and says "my name is Davis". HAHA! I think it's groovy that you're Melody was named after a Saturday morning cartoon too. I just love "Josie & The Pussycats". It's one of my favorite cartoons! I love that cartoon. It's one of my favorite Hanna Barbera's. I'll have to look into that Archies song. Me and my doll mom, Sharry just wanted to thank you for saying nice things about my time capsule to that lady Karen! So thanks a lot! You're welcome. It was a pleasure to comment on Karen's post. 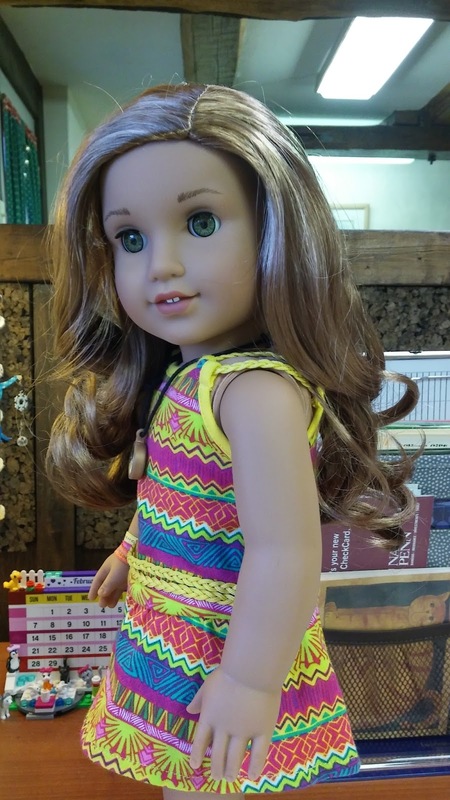 I live outside the U.S and Canada so the first American Girl doll I ever saw was Lanie, my friend's doll... And I thought she was beautiful! What was awesome was that after secondary school (high school) she gave it to me! I mean, it was sort of sad that she went out of dolls, but people change. She went on to be a designer though and since we do a 'BFF gift swap' on new year's day, she designed a perfect Lanie-inspired outfit for me! I enjoyed meeting your dolls. It's fascinating to get a glimpse of how people come to love certain dolls above others. Have you ever read "The Birchbark House"? Great novel with a Native American girl character. I'm glad Haley was added to this page. My friend Jennifer's middle name is Rose, too! Jennifer Rose is a lovely name. Actually, her last name is Murray. Our doll mom named her after characters in an episode of the old TV show "One Step Beyond". There were 3 little ghost girls named Jennifer, Rose and Mary. She says that was her mom's favorite episode of that show. That's really neat. I did a search on that show, but couldn't pin down the episode. Looked like a very interesting show. It's called "The Dead Part Of The House". That does sound like a very interesting episode (IMDB has a better synopsis than TV.com)! Thank you for the title. Great to read all the comments on your "Meet the Girls" page. All descriptions are super and special. Thanks for an informative and interesting blog. Grace looks awesome with the blue hair extension! It really suits her, doesn't it? Your dolls are all SUPER cute and adorable! I love your photography sooooooo much! Grace's blue hair piece is really pretty!I'm thinking of getting a Madame Alexander doll. I was wondering, do you recommend them? Hi! Thank you! I'm glad you like the girls and my photos. I'm for any doll you love. Haley is very sweet in her expression and fun to style with wardrobe. She's a touch slimmer than her sisters. I love that she can tilt her head. Her hair is very thick which is good and challenging at the same time. That was a fun calendar! Kirsten and Kaya have been nominated for the Sisters Award! Go to my blog, AG's Wondrous World, to see what they get to do! Congratulations! That's cool! Thank you! We'll head right over! Melody and Lanie have been nominated for the Sisters Award! Check out my blog, The Savage Dolls, to see what they get to do. Congratulations! Your dolls are beautiful! :) I love the name "Silverleaf" it sounds so pretty.